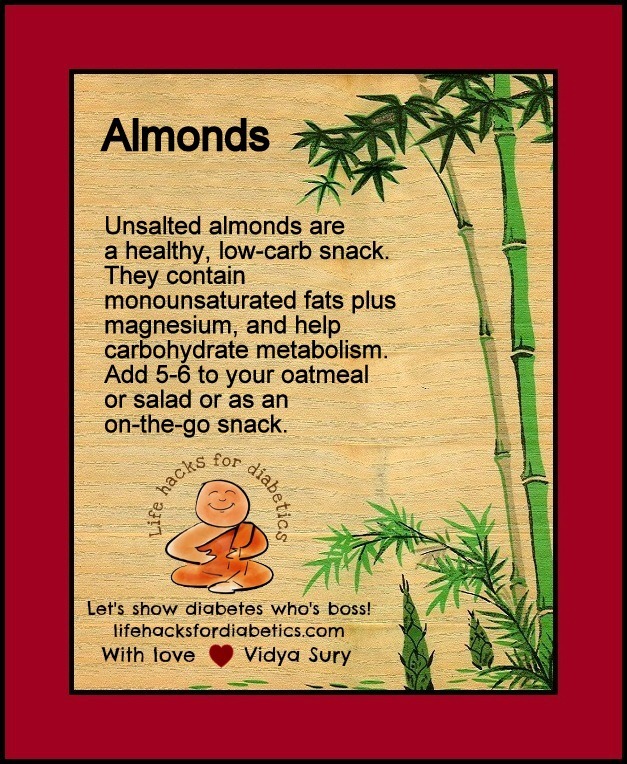 Unsalted almonds are a healthy, low-carb snack. They contain monounsaturated fats plus magnesium, and help carbohydrate metabolism. Magnesium reduces the risk of developing diabetes by 33 percent. Add 5-6 almonds to your oatmeal or salad or use as snack. Maintain portion control – almonds are great, but too much can add up on the calories! I love almonds! I am not diabetic, but any tips for healthier eating are fine by me. I love your blog set up. The images are great too! Yes, walnuts too 🙂 My brother eats it as a snack. Another interesting post. You have two blogs in the challenge? That is pretty cool. Looking forward to seeing what you post all month. I love the theme for the challenge and I believe so very, very strongly in the healing power of a clean and healthy diet! I’m really looking forward to seeing what comes next! I love almonds. Tasty, filling and easy to carry with you! Great tips, I shared it for my friends on Facebook.